Sauro & Bergstrom is pleased to announce Kyle S. Willems has joined the firm as an associate. Mr. Willems focuses his practice in the areas of construction, insurance and general commercial litigation, including trials and appeals. Prior to joining Sauro & Bergstrom in 2014, he served as an attorney at a St. Paul litigation firm, representing both individuals and companies in all areas of litigation. Through his experience, Mr. Willems is able to address the legal and business needs of Sauro & Bergstrom’s clients by handling litigation with practicality and efficiency. Mr. Willems graduated from the University of St. Thomas School of Law in 2013 with a focus on civil litigation. 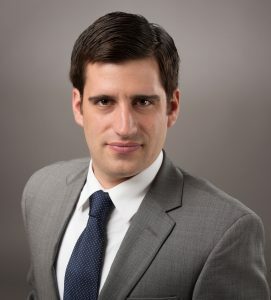 He served on the Board of Advocates and participated in moot court, taking first and second place in 2013 and 2012 respectively, and receiving two consecutive scholarships from the Minnesota Intellectual Property Law Association. Mr. Willems was also a two time regional semi-finalist in the Giles Sutherland Rich Moot Court Competition. He remains an active alumnus of his alma matter, having coached St. Thomas’ McGee Civil Rights Moot Court Team and the Giles Sutherland Rich Moot Court Team. Mr. Willems is a member of the American Bar Association, Minnesota State Bar Association, Hennepin County Bar Association, and Ramsey County Bar Association. He currently sits on the New Lawyers Section Board for the Minnesota State Bar Association. He received his B.A. in Political Science from the University of Minnesota. His interests include playing hockey, supporting University of Minnesota athletics, and serving as the attorney-advisor to the Irondale High School Mock Trial Team.